If you have been reading my blog for any amount of time, or follow me on social media, you will know that seven years ago my mother-in-law moved with us. Not too long after she moved in I noticed she was hesitant to leave the house. It wasn't until I asked her about it that I learned it stemmed from her bladder leakage issue. First things first, TENA® incontinence products for women. I love the TENA® brand because they are affordable and they let you be you. Designed for comfort and made for performance, TENA® incontinence products let you live your life without compromise. Walmart has a large variety to meet every need. 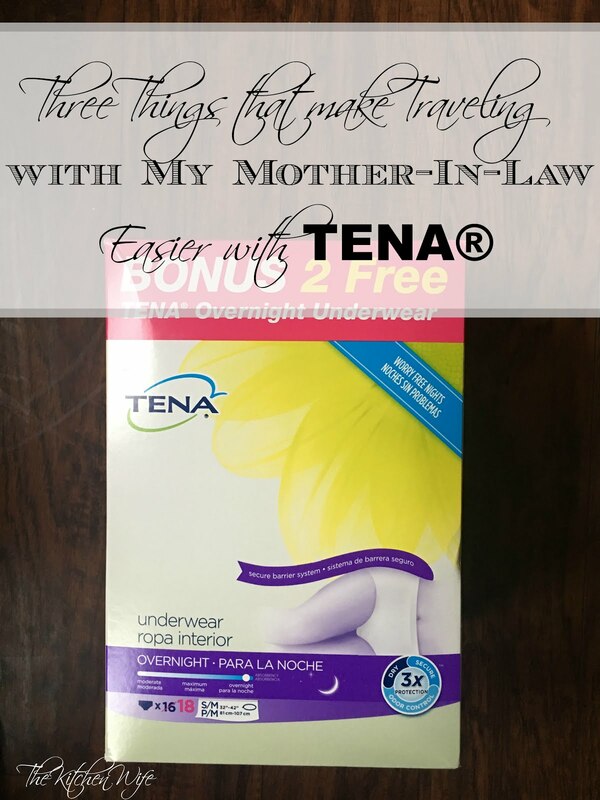 My mother-in-law enjoys the TENA® Overnight Underwear . The Soft, cloth-like material provides comfort; designed to look and feel like regular underwear and the Specifically designed to protect against leaks while lying down. Secondly, I always keep a change of clothes. With all of TENA®'s wonderful qualities things happen, and I find being prepared for anything is always wise. I just keep something simple on hand that is easy to slip on in a public restroom. And lastly I like to keep baby wipes of some sort to clean up with in a pinch, as well as a large resealable bag to keep anything that may get soiled. I keep everything neatly together in a nice tote in the back seat. It is elegant and discrete. And FYI, this product is coming soon at Walmart and will have the same great technology as the TENA Intimates™ Overnight Pads. Also I would like to mention that on Sunday, March 4, 2018 you will want to keep an eye out because there will be an FSI in the paper where you can get $5 Off Any One (1) TENA Overnight Underwear Product. The offer expires 3/18/2018 (2 week duration). This offer can only be redeemed in-store. So if you or your loved one experienced bladder leakage remember...YOU'RE NOT ALONE and you CAN live a full life! Thanks TENA® for creating such wonderful products for woman. And be sure to head on over to Walmart for yours today!